This seems to be an improbably tight grouping to be from two 14in shells. I would expect a separation at least equal to the height of the splash. Yes I agree, … in fact the PoW smoke screen is to the right of the 2 fall of shot and not of the PoW under the German fire. That in fact is exactly the way I read it. What is important is the clear identification of the 2 PoW shells against the background, ... the impact of their fall of shot, … well separated from the PoW under fire from the Bismarck. Anyway, … now all should be clear enough for everybody. Bottom line, do you agree that on the fact that the 2 shells ( A + B on my pics ) were from the PoW and the 3 shells we can see falling very close to the PoW ( 1, 2 and 3 on my pics ) that was leaving the battlefield making her smoke screen are from the Bismarck ? The obvious correspondence of this photo timing with the PoW gunnery map and the Prinz Eugen battle maps will do the rest of properly timing this photo as I already did long time ago. the 3 shells we can see falling very close to the PoW ( 1, 2 and 3 on my pics ) that was leaving the battlefield making her smoke screen are from the Bismarck ? I disagree. In my unedited high quality version of the picture 1, 2 and 3 are totally missing. The pop up menu says this is an original caption supplied with the photo, not something generated by an indexer later. Or worse still written 75+ years later by somebody with an opportunist/sensationalist book to write. "leaving the battlefield"...……. wasn't Bismarck "leaving the battlefield" as well at the same time? Is there a standard size for a naval battlefield? Are there "linesmen" to identify when contestants are outside the field of play? Do you have to hold up a board with their number on when they want to "rejoin the battlefield" as Prince of Wales apparently did just a few minutes later? Is an American battlefield "bigger and better" as at Midway and Leyte Gulf? The "battlefield" continued to follow Bismarck through the 25th and 26th. IIRC Bismarck "left the battlefield" vertically on the morning of the 27th. This puerile campaign of defamation now pervades every utterance. Yes, according to the pop-up it's the original caption to or on [probably the backside of] the picture. Regarding the photo discussion, I would approach the greatly enlarged and highly modified images, and their associated interpretations by Mr. Bonomi (and others? ), shown in Mr. Bonomi's posts on 09 September, with considerable skepticism. They are screened and highly modified images. The screening process itself, used to reproduce the photographs in book form, can -- either on purpose (to make the picture 'look better') or by accident -- both removes significant data and adds artificial artifacts which can often result in visual illusions. No amount of subsequent modification can remove these; the damage has already been permanently done via the screening process itself. An unmodified photographic print, which has not been screened, is a much much better reference source. Although the print does remain somewhat interpretive, and is always to some extent an expression of the skill and intent of the photographer working on the easel in the darkroom (remember those? ), it always remains much much better than anything that has been previously screened. In this particular case, an original photographic print, or a high-resolution copy of the same would retain much more information than any previously screened image, which for detailed interpretive work is often essentially useless. Ideally, it would be best to locate and view the original negative(s) which hold, probably, three or four times the information content than a typical photographic print does. Examination of the negative(s), because they retain information on image scale, would also probably permit some fairly high-quality photogrammetry to be done. If someone knows if these still exist, and can examine them, that might move the this discussion forward considerably. Has anyone done this, and does anyone know if the negatives are actually still available? I have many versions of that photo ( IWM and BA ) including one original high quality scan photo taken from an original war time printed photo, ... including also scans from Otto Schlenzka and Hans Henning von Schultz originally owned photos, ... and the 3 Bismarck shells ( 1, 2 and 3 ) are well visible on all the photos, ... just as I showed you all here in too, ... here above. On 1943 publications those 3 shells are visible as well close to Prince of Wales, ... and nobody was editing or cropping anything on 1943. Anyway, those 3 shells are not so important, ... because the important ones are the 2 shells visible on the fall of shot from PoW ( A and B ) landing close to the Prinz Eugen. Now, please explain us all why you tend to disagree about them ? What is your problem here ? What are they according to you ? you are right, and this is the reason why I work with all original high quality material all the time I can, ... like in this particular case. I have a lot of DS original photos like this NH 69731, ... including some never published ones , ... but I have never found the negative or the full PG film yet, ... because the one we see is the propaganda reduced and cutted/paste version of the original film. "Hood 1" is not a flaw in the print as has been suggested, however, it does not originate from Hood either. "Hood 1" is much closer to the camera than "Hood 2". "Hood 1" is in fact a single shell splash and it is also closer to the camera than the "2 shells" on the right. Moreover, I believe "Hood 1" and "2 shells" belong to the same salvo directed at Bismarck from the after turret of Prince of Wales. Interesting point re.Hood 1. I however doubt it can be a splash from PoW. In the film and in the photos we always see white water column, not black. Also, the distance between the 2 splashes would be a bit too large (over 700 meters) for coming from the same after turret, even accounting for the "large spread" of the maneuvering PoW (at 6:03 PoW had ended her "hard turn" and started much smoother maneuvers anyway). The difference is that the water column in "Hood 1" is still gaining height, while the 2 splashes on the right are already falling down. The "black color" that you mention for "Hood 1" is a grey shade on the left side of the splash but it is actually white on the right side (it just difuminates with the white background). 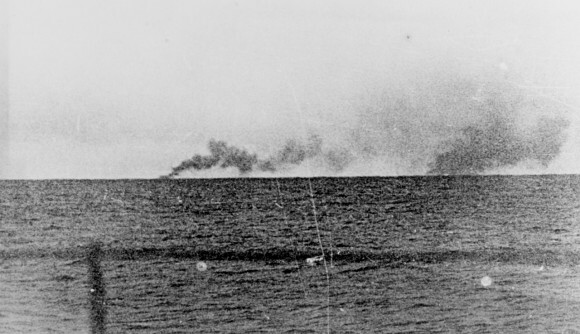 Just like in the splashes around Bismarck during the 27 May battle (white on the left side and grey on the right side). One thing is pretty clear for me, "Hood 1" is not from HMS Hood's remains burning and has nothing to do with "Hood 2". Y2 and Y3 guns were out of action at salvo 19. Y3 was back in action only at salvo 21 (according to McMullen GAR). Also, this shot is a bit too far from the other two if belonging to the same salvo. Do you think it can be a high explosive 5,25" shell fired in local control by a secondary turret of PoW (according to Leach narrative, the HALA directors were all temporarily out of action or unable to take over the control at that time, but there is no explicit mention to a "cease fire" of the 5,25" battery.....) ? Smoke doesn't blow upwind, it blows downwind. All the smoke in the photo blows downwind. Whatever Hood 1 is, it can't be a new kind of smoke that travels upwind. Im Ersten Gefecht has a retouched version removing all the scratches and blebs but its still there and identified as a "Rauchwolken" smoke cloud. One of the different versions Antonio says he has, might throw more light on it. If "Hood 1" on NH 69731 were smoke from HMS Hood, there would still be some type of trace left on photo NH 69725 which was taken just a few minutes later exactly from the same spot aboard Prinz Eugen. On NH 69725 we can still see smoke trace from "Hood 2" (left )and "PoW" (right), but there is nothing remaining of "Hood 1" just as there is obviously nothing left of "2 shells". Norfolk didn't open fire but if she did, she would have fired a salvo.